Up Front or – the never ending story? Tiger Leader – new solitaire & coop WWII board game! 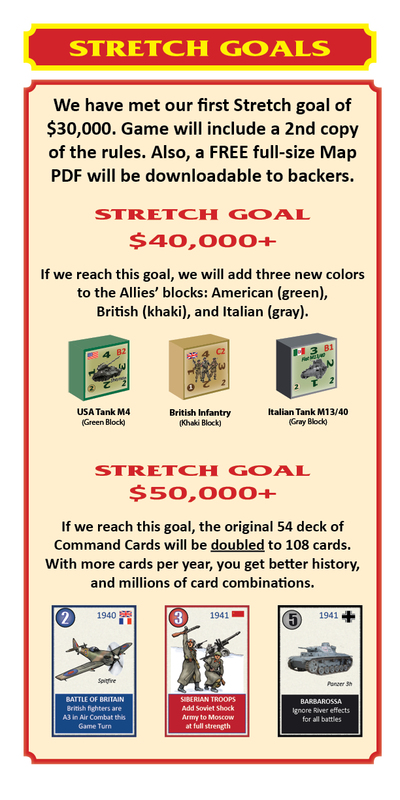 Victory in Europe by Columbia Games funded! Columbi a Games has a new game in the pipeline called Victory in Europe and the Kickstarter Campaign has already reached the goal to fund the game. Now in the remaining days left you may still help to reach the stretch goals of the campaign to make the game even more interesting to play! 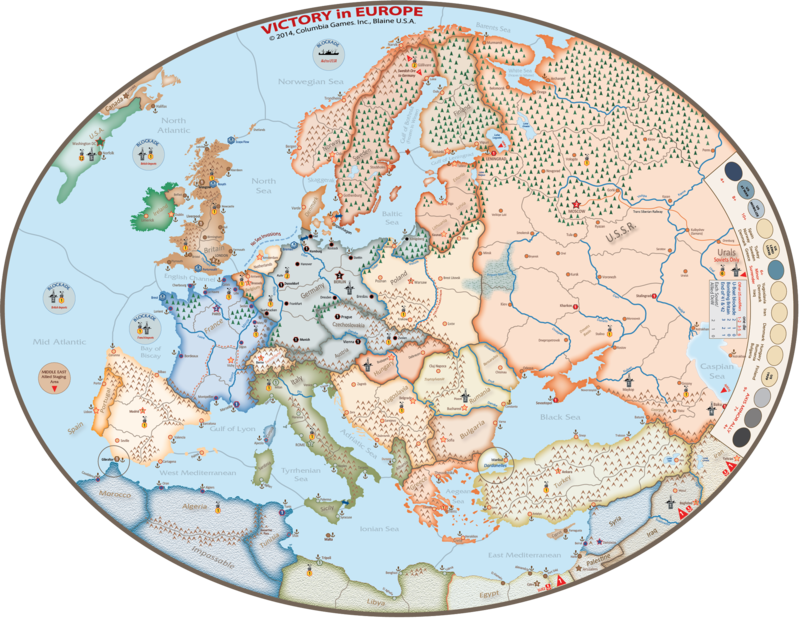 Victory in Europe is a strategic block wargame of World War II for 2 or 3 players that captures the entire war in Europe in a fast-paced experience. The game begins in late 1939 and ends up to six years later. Game time is 3-5 hours. Basically designed as a two player game there’s also the option to have the Soviets to be commanded by a third player. The game is card driven with the Allies and Axis each having their own deck and the possible actions are based on the different functions of the cards in play. Cards depict historical events or give a more general advantage in terms of maneuver. The game is designed with a historical flow of the war in mind but allows for new twists and turns based on the players decisions. To get an impression you can check out the rules synopsis here! Some may question the need for another WW2 strategic level wargame since so many are already available that portray this gigantic struggle from different perspectives but most if not all of these games are quite lenghty when it comes to playing time and often use a lot of tablespace. So many players are still waiting for a historically accurate wargame on the strategic level that plays the whole ETO scenario in a couple of hours…Victory in Europe might be this game we are all waiting for! If you think that this game could be for you support the stretch goals on the official Kickstarter website! As always Columbia Games products come with a money-back 30 day guarantee, that means if you don’t like the game just send it back to them and you’ll get a full refund so there’s no risk for you to back them! I have always enjoyed grand strategy games on WW II in Europe and spent many hours of my youth playing “Third Reich” and “Advanced Third Reich.” Some of you may remember SPI’s monster game on WW II with division-level units and spiral production charts. Oh those were the days when we had weekends to play. Now, however, I find I do not have the time or patience to learn 30 or 50 pages of rules with hundreds of exceptions. I prefer a game I can play in a long evening with minimal time looking up rules. I started thinking about designing my own WW II game back in 2002 and then learned that “Europe Engulfed” was in development. Having discovered and fallen in love Columbia’s block games in the 1990s, I shelved my idea thinking there was no need since a playable block game was in development. When Europe Engulfed came out my friends and I played it practically non-stop and I still love the game, but I felt I still would like to see a game with less playing time and fewer exceptional rules. My goal was to take the things I liked most from Third Reich, EE, and other great WW II games and blend them into something new. I started in earnest around 2005 and found my first design, while using fewer units, was still a monster game. I started with hexes, then went to areas, and then back to hexes. I had abstract concepts for managing the air war off map and intricate spiral production charts that would put SPI to shame, but the more cool things I thought I wanted in the game the longer the playing time became. Through much trial and error and literally dozens of game mechanics and different maps, I feel I have finally succeeded in designing an enjoyable game that is playable in a long evening thanks to the help of Tom and Grant Dalgliesh at Columbia Games. To accomplish this goal of course, much of the chrome originally envisioned has fallen by the wayside. These are the trade-offs for the Holy Grail of a WW II grand strategy game playable in one sitting. Setting the right victory conditions to make the game challenging for both sides is one of the harder aspects of designing a game. I decided to make conquest of Britain or the Soviet Union a game-ender to give the Axis player an incentive to go for the big win but there are many paths to victory. I hope you find the choices made acceptable and enjoy the game.